You know, I am generally not a big fan of technology. I really do miss the days of three channels and having to get up to change them. I miss talking to real people in customer service. I miss being away from home and unavailable. One thing I have to say is that technology has made the world very small, and with three kids in the military that makes me happy. When I was in the military I called home, on a pay phone, once a week and it cost $10.00 or so. My parents didn’t know what was going on in my life on a day to day basis (and that was probably a good thing), and I didn’t know what was going on with them. I got letters from them once in awhile and I sent them letters thick with polaroid images of where I was. On Christmas Day we skyped with one of our kids who is away from home. We set the iPad on the counter while we ate and talked with him, laughed, and shared our meal just as if he was home — except of course he was eating food from the mess hall. It went on for an hour and it didn’t cost anything. We did the same thing on New Years with the son that is in Okinawa. I can chat with any of our kids every day if I want. I can read their Facebook pages, I can text them. They send me pictures and videos. So, while I really do miss so many things about our slower, simpler life in the 60s and 70s I love many things about life in the fast lane of 2015. It’s just sometimes I focus on the things I don’t like about it rather than the things I do. But… big, chewy chocolate chip cookies? They’re forever. I am not sure these will be great cookies for shipping – but I will let you know because I am sending a batch to Okinawa. I asked Matt if he thought they’d be too gooey and messy by the time they got there and he said: It’ll get messy but it will be fine they look delicious! So… off they go for an 11 day trip across the world. Update: They arrived perfectly! These big, yummy, addictive, chewy chocolate chip cookies aren’t the kind of cookies you send to school in a lunchbox (unless you are in heavy competition with another kid’s mom). 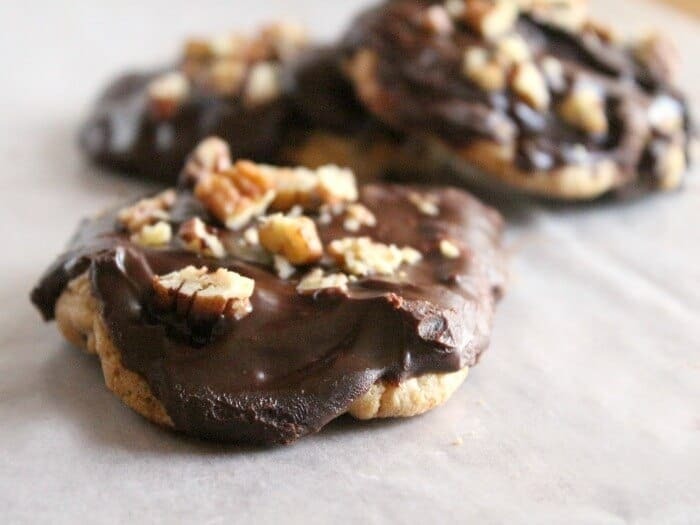 They are the kind you make for serious comfort, celebration, or chocolate craving. In fact, Nick (14) told me he liked them best without the ganache because it was almost too much chocolate. Thick, chewy cookies with gooey chocolate chips are one of those things most of us strive for in life. Here are some tips to help you make that dream come true. What Makes a Chocolate Chip Cookie Chewy? Keeping the moisture content high is what makes your cookies chewy – that’s why brown sugar is SO great in chocolate chip cookies it keeps them moist! Other things that contribute to high moisture content are oven temperature, how well the ingredients are blended without being over mixed, and how much flour is used. Overbaking them will make them crispy. 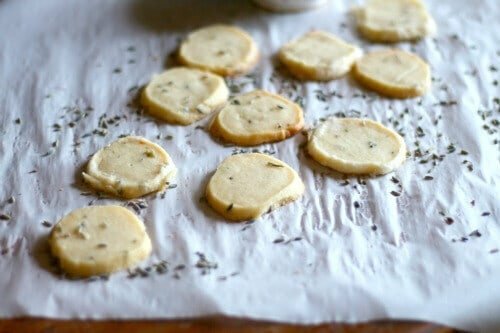 Take the cookie out of the oven when it’s just slightly underdone and leave it on the cookie sheet for 5 minutes then remove to cool completely. You can try adding 1 extra egg yolk to the recipe. If you are anything like me your cookie sheets need replacing… often. I used to just buy cheap ones but once my husband replaced my cookie sheets with higher quality ones and I was hooked. Better heat distribution, better quality cookies! This big, bold, chewy chocolate chip cookies are the best way to bring a real chocolate lover around to your way of thinking. It’s not even a fair fight with all of that chocolate ganache on top! If you love this easy recipe please give it 5 stars, thanks! Big, thick, chewy chocolate chip cookies are full of buttery goodness. 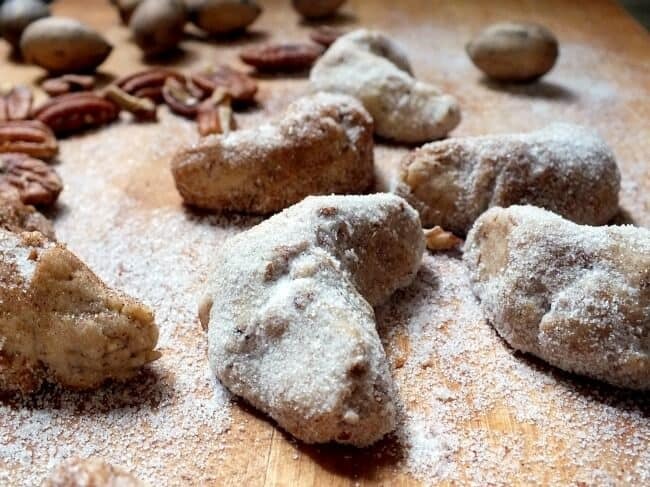 Once cooled they are dipped in a rich ganache and then sprinkled with more pecans. Cream together the butter and both sugars until smooth. Beat in the eggs and yolk, one at a time incorporating them well after each addition - about 3 minutes. Dissolve baking soda and salt in hot water. Add the baking soda mixture to the batter. 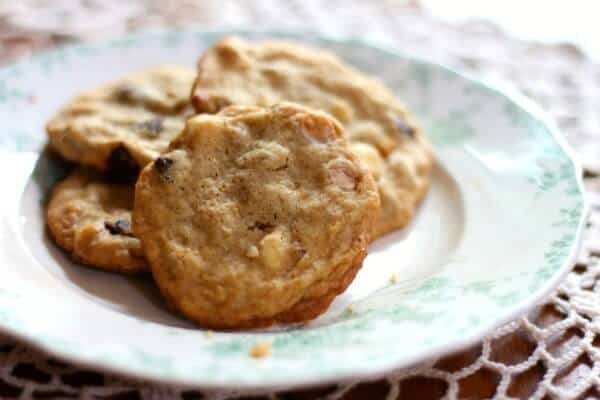 Fold in the chocolate chips, and 1 cup of the nuts. Drop by mounded tablespoonfuls onto ungreased pans - 3 inches apart. Bake for 10 to 12 minutes in the preheated oven, or until edges are golden but the center is still slightly underdone. Dip in the melted ganache. Sprinkle with 1/2 cup reserved pecans. Microwave the cream until it begins to bubble. Remove from microwave and stir in the chocolate until it is melted and smooth. 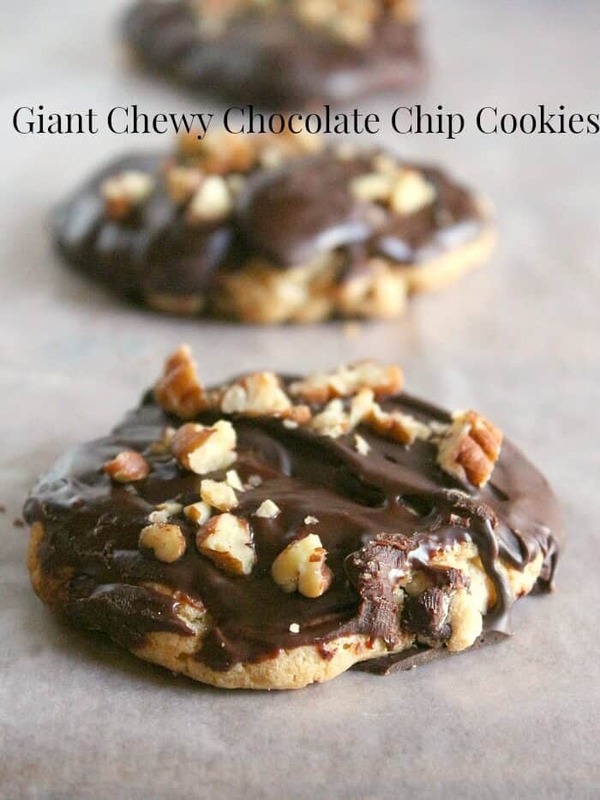 This is a great cookie post/recipe! OK, you talked me into it. LOL These look scrumptious!!! Yum! These are the exact kind of cookie I want when I’m craving chocolate chip. Love that they’re covered in chocolate too! The more chocolate the better? There’s always room for chocolate, yum! Almost too much chocolate he says! Haha, I love a good ole chocolate chip cookie, and what better than a giant one?! Agreed! The more chocolate the better! we do the same thing, being a military family, to keep in touch with our family in the States but I do remember waiting for snail mail from my dad when he was deployed which was almost all the time back then! These cookies look great, btw! Thanks Alice…and thanks for your family’s service!! God Bless the internet for making it so convenient to keep in touch around the world. And hey, if the cookies fall apart in shipping, your boy can always dump them into a bowl and pour in some milk to eat them like cereal. I had one son do just that… LOL! I have to laugh about you sending those to your son in Okinawa. A mother will do what it takes to get treats to her children. They do looks delicious! Thank you Linda. Yep. I am an expert cookie sender! Could I form these in small heart shaped pan or would you suggest using a different recipe? Thanks Mary either way I will be making these. I made two in mini heart shaped pan, they turned out cute and taste delicious. Thanks for yet another great recipe. 9 degrees here today good to have the oven on. Ha I was still giggling over your competing with some other mom comment and then Susan’s comment got me giggling again. And I know your son will love these. They look over the top awesome in the very best way possible. Too much chocolate! Ha! 🙂 I am serious about the competition thing. I swear to you it seems like there are a handful of women in my life (past and present) who have tried to one up me…. silly women. They probably are – somewhere! It’s just amazing things that technology lets us do now, isn’t it? Also amazing are these cookies!